The Fellowship was fortunate enough to obtain a copy of STRETCH ARMSTRONG AND THE FLEX FIGHTERS #1 from IDW Publishing. The story is written by Kevin Burke and Chris "Doc" Wyatt; with art by Nikos Koutsis, colors by Mike Toris, and lettering by Christa Miesner. Jake Armstrong and his friends Nathan Park and Ricardo Perez were exposed to a chemical called Flexarium and have become Charter City’s protectors: The Flex Fighters! They have assembled to take down the latest threat: a giant-sized praying mantis that is attacking the city. Eventually they take down the insect, but what caused the mutation and why was it attacking? Our heroes are about to find out...but they won’t like the answers. I must admit I remember the classic toy from a long time ago, but never knew there was an animated series on Netflix featuring a new take of the character. Misters Burke and Wyatt present a really fun read; action-packed with humor and a little drama. There’s enough exposition to get you up to date regarding the characters; especially “Stretch” since he’s the lead. Exciting art provided by Nikos Koutsis, and Mike Toris’ bright color scheme round out the issue. All-in-all a great all-ages book that is worth checking out. 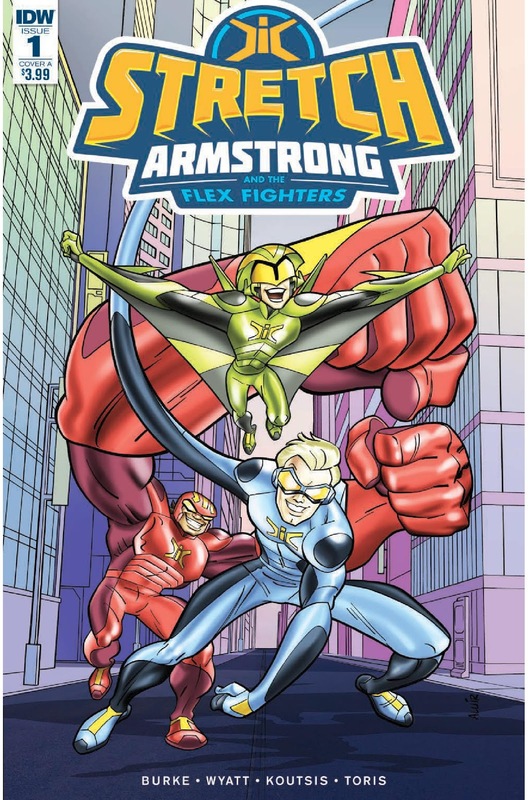 STRETCH ARMSTRONG AND THE FLEX FIGHTERS #1 is in stores now or available at www.idwpublishing.com.